The fantasy story line inside the Political Industrial Complex* (PIC) is that Team Trump colluded with Russia to tilt last year’s election to Trump. Of course the endless screw ups by Team Clinton, and the high level of frustration across this great land with PIC and its elites, had nothing to do with the election results. It has to be those pesky Russkies! 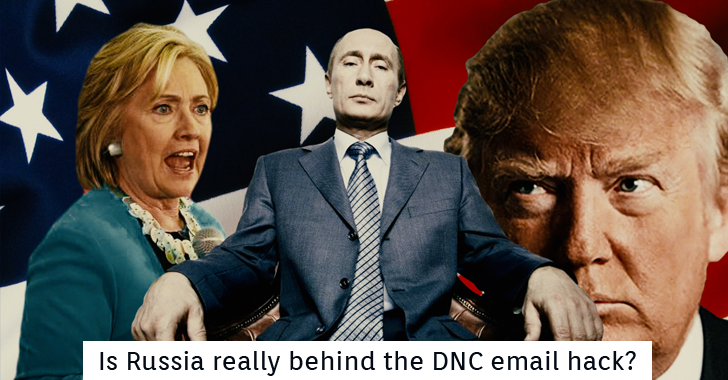 The story goes that the FBI – and all 16 intelligence agencies – concur that the Russians were targeting the Democrats, and this began with the exposure of DNC emails prior to the Democrat convention last year. A fuller picture is becoming evident. One where nearly all the conclusions of Russian influence are based upon a report from one company – a company contracted by the DNC! On Thursday, a senior law enforcement official told CNN that the DNC “rebuffed” the agency’s request to physically examine its computer servers after the alleged hacking. Instead, the FBI relied on CrowdStrike’s assessment that the servers had most likely been hacked by Russian agents. “The FBI repeatedly stressed to DNC officials the necessity of obtaining direct access to servers and data, only to be rebuffed until well after the initial compromise had been mitigated,” CNN quoted the senior law enforcement official as saying. “This left the FBI no choice but to rely upon a third party for information. Sounds just like Hillary Clinton and her email server – where the government cannot do a real investigation of the actual computer evidence. If this sounds fishy, it is. Because this company is not a middle of the road, independent agent. One of the founders is Dmitri Alperovitch who was born in Moscow, Russia in 1980 and who moved with his family to the US in 1990. Clearly he had not forged nefarious ties to Putin’s regime by the age of 10 when he emigrated, so his Russian background is not really of much interest. But he does have an interesting past, which I will get to in a second. Founder Dmitri Alperovitch has been the best known face of CrowdStrike, partly due to the profile feature done on him by Esquire in late 2016. But his co-founder, George Kurtz – like Alperovitch, a former executive at McAfee – has had a high professional profile as well. This equity firm is where the initial seed money for CrowdStrike came from (Warburg was the only capital investor at the beginning; Google came in with the $100 million in 2015). Then there’s the linked-ness of the CrowdStrike executive stable. Steven Chabinsky, CrowdStrike’s General Counsel and Chief Risk Officer, was named to Obama’s Commission on Enhancing National Cybersecurity in April 2016. That’s partly because Chabinsky was Deputy Assistant Director of the FBI’s Cyber Division and Chief of the FBI’s Cyber Intelligence Section before he left the Bureau for private life in 2012 (the year he joined CrowdStrike). In other words, CrowdStrike scored the FBI’s two biggest Obama-era cybersecurity names – Henry and Chabinsky – the year it was formed as a start-up. Strong ties to Obama’s FBI, and one would assume FBI Director Comey. Hmmm…. Now just hold on one second here. How in the world does a nobody at MacAfee get on a plane to meet the Secretary of State in just 3 days? No vetting? No preliminaries with underlings? Just fly out to DC to review a single paragraph?? This has to be fictional drama. In 2011, he was working in Atlanta as the chief threat officer at the antivirus software firm McAfee. While sifting through server logs in his apartment one night, he discovered evidence of a hacking campaign by the Chinese government. Eventually he learned that the campaign had been going on undetected for five years, and that the Chinese had compromised at least seventy-one companies and organizations, including thirteen defense contractors, three electronics firms, and the International Olympic Committee. Alperovitch removed the word China from his analysis, calling the operation Shady Rat instead. He told me that James’s intervention accelerated his plans to leave Intel. So which story-line is the right one? Not sure, but let’s just say not just anyone gets called to review Hillary’s speeches. Through their common roots in McAfee, Alperovitch and Kurtz have an extensive history with top cyber expert Phyllis Schneck, who appears in the Esquire piece from October. In fact, Alperovitch and Schneck were at Georgia Tech together (see the Esquire article), and later were vice presidents of McAfee at the same time Kurtz was McAfee’s chief technology officer (CTO). Alperovitch has obviously had a close professional relationship with Schneck; their names are both on four separate patent applications. What is Schneck doing today? Since 2013, she’s been the Deputy Under Secretary for Cybersecurity and Communications for the National Protection and Programs Directorate (NPPD) – i.e., the chief cybersecurity official for the Department of Homeland Security (DHS). To recap, all the claims of Russian involvement with DNC (and by extension Team Trump) is based on claims by a firm with roots back to the Obama FBI, to Secretary of State Hillary Clinton and to DHS? This is the only evidence we have of Russian efforts to tilt this election (as opposed to efforts by Democrat operatives in the Deep State to tilt the election)? Also remember that it is only Alperovitch and CrowdStrike that claim to have evidence that it was Russian hackers. In fact, only two hackers were found to have been in the system and were both identified by Alperovitch as Russian FSB (CIA) and the Russian GRU (DoD). It is only Alperovitch who claims that he knows that it is Putin behind these two hackers. The ridiculously fake cyber-attack assessment done by Alperovitch and CrowdStrike naïvely flies in the face of the fact that a DNC insider admitted that he had released the DNC documents. It is also absurd to hear Alperovitch state that the Russian FSB (equivalent to the CIA) had been monitoring the DNC site for over a year and had done nothing. No attack, no theft, and no harm was done to the system by this “false-flag cyber-attack” on the DNC – or at least, Alperovitch “reported” there was an attack.